2009 WITI Silicon Valley Mixer at Kingfish! Millions of people use Facebook everyday to keep up with friends and colleagues. Click here for details and select the "Request to Join Group" link to show your support, get updates, special offers and more. The 2009 WITI Summit Returns to the Silicon Valley in June! Social media tools are the newest revolution in technology and the hottest thing going for creating a "buzz" about you, your company, your products and anything else you want to promote. WITI's Social Media Café is hands on to teach you how to optimize your presence and learn from the industry experts how you can make things happen through your use of blogging, Facebook, Twitter, LinkedIn and other critical tools we know can help you succeed. The World Café is the ideal structure to achieve concrete deliverables as we develop and expand our ability to innovate, collaborate and reinvent. It will provide us an ideal framework for making magic happen - one which we believe could not be more appropriate for WITI's 20th anniversary celebration - after all, the idea of creating transformation and innovation by bringing together women from different parts of the world, with different perspectives, experiences, backgrounds, speaks to the heart and soul of why WITI was founded and why WITI continues to lead the global market for women. Register Today for Discounted Early Bird Rates! This Summit will incorporate the principles of the World Café into our Social Media Café where we will learn how to leverage a variety of social media tools. For sponsorship and advertising information, email [email protected] or call a WITI representative today at 800-334-9484. Self esteem is a tricky concept. Everyone wants it but most people are convinced that they don't have nearly enough of it. So how do you go about getting more? I am a strong believer that at the core of self esteem you will find a skill that differentiates those who have high self esteem from those who don't - and I also strongly believe this skill is learnable. So let's explore the following: What exactly is self esteem? What is the core skill that supports it? How can you learn that core skill? WITI 20th Anniversary Special Offer! Included with your WITI Membership Fee is a One Year Subscription to Wired Magazine ($12 Value)... Click Here to Become a WITI Member Today! Remember when women weren't allowed to vote? Of course you don't, neither does your mother. But a hundred years ago, Susan B. Anthony was one woman who was fighting for that right ... and won. Throughout the 20th century, Anthony and so many other women opened doors for us, both in and out of the workplace. During Women's History Month, it's good to look backward and forward: backward on the accomplishments of those who came before us and forward to understand how their model can help us in our workplace and our lives. Participants in these teleclasses and webinars have made major changes in their lives, after just the first class! This series will help you to gain a clear understanding of your unique gifts, passions, needs, and values, so that you can discover what you want to do with the rest of your life. This class is DISCOUNTED for WITI members... Click here for details! With over thirty years of cardiovascular research experience, Sandra has contributed to the advancement of science and technology as a prolific author of more than 80 abstracts, book chapters and publications in scientific journals. This class is INCLUDED in WITI membership... Click here for details! Click Here for a Complete List of WITI Member Webinars & WITI Teleclasses! Brian Garavuso provides strategic technology direction and information technology management for Diamond Resorts International. Diamond develops, markets and globally operates in 21 countries with a system of 150 quality vacation ownership resorts servicing more than 380,000 member / owners. Mr. Garavuso will speak to the technology and innovation taking place in the guest rooms of the future. There is not a day that goes by that we do not hear about the recession going on in the US and around the world. Within IT departments, we are beginning to hear about projects that are suddenly not necessary, representing a shift in spending priorities. For now, it is imperative to find new ways to finance projects as well as research the cost optimization in IT. GEICO offers low rates, exceptional 24-hour customer service, and high-quality car insurance to over 8 million policy holders in the United States. GEICO also offers insurance products for motorcycles, boats, homes, and personal umbrella protection. Visit the award winning GEICO.com for your complimentary, easy, no-obligation rate quote. Your subscription to WITI's newsletter could save you even more money. Visit: www.GEICO.com or Call: 1-800-368-2734 and Mention WITI to Receive Your Discounted Quote Today! Lenovo is pleased to provide WITI members with this great offer on its entire product line, including the award winning ThinkPad® notebook, new and highly acclaimed IdeaPad™ multimedia notebooks, innovative ThinkCentre™ desktops and computing accessories. 2) In Addition, save up to 15% with your WITI membership discount. Visit the website often, as special time limited eCoupons (in addition to the savings noted above) are provided frequently! Redemption Instructions: Visit www.lenovo.com/witi or call 1-800-426-7235, option 1, ext. 5719 to take advantage of discounts on select products. FREE ground shipping available on all web orders! Terms and Conditions: Savings referenced off regular Lenovo.com price (not in addition to standard affinity discount) and available direct from Lenovo on select products. Offer not combinable with other discounts, offers or promotions. Offer valid in US only and subject to availability. Lenovo reserves the right to alter product offerings and specifications at any time without notice. 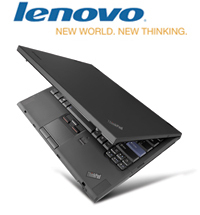 The following are trademarks of Lenovo Group, LTD. or one of its subsidiaries: ThinkPad and ThinkCentre. Keeping you up-to-date on where you'll find WITI! WITI partner events provide an excellent opportunity for peer-to-peer networking and job growth amongst tech savvy women and men. For a complete listing of WITI events in your area, click here! Join WITI @ A POWERFUL NOISE Live! Plan to join our partner organization, CARE, and more than 120,000 people gathering in 450 theaters across the United States to celebrate International Women's Day 2009. On the evening of March 5, CARE is hosting an unprecedented one-night event featuring "A Powerful Noise", an acclaimed documentary that follows three extraordinary women - Hanh is an HIV-positive widow in Vietnam, Nada starts a women's cooperative after the Bosnian war, and Jacqueline educates girls in Mali. The film takes you inside the lives of these women to witness their daily challenges and significant victories over poverty and oppression. Immediately following the film a town hall discussion will be broadcast live from New York to participating theatres, with renowned activists and experts including Nicholas Kristof, Christy Turlington Burns, and CARE President & CEO Helene Gayle, to discuss how we can empower women around the world to fight global poverty. WITI members can attend the event with friends and colleagues, and WITI local networks can make A POWERFUL NOISE Live their own International Women's Day program for 2009. Simply participate in the event together and then discuss the issues raised in the film at your next meeting. Visit www.apowerfulnoise.org/guides.html to download a planning guide with more engagement ideas. Join WITI @ InfoSec World 2009 Conference & Expo! WITI Members Get 10% off InfoSec World 2009 Main Conference! See below for details about this special offer. InfoSec World Conference & Expo 2009 features over 100 sessions, dozens of case studies, multiple tracks (including a brand-new, hands-on hacking techniques track delivered by The SANS Institute), 15 in-depth workshops, and 2 co-located summits! With the primary objective of providing top-notch education to all levels of information security professionals - from CISOs to system administrators - InfoSec World delivers practical sessions that give you the tools to strengthen your security without restricting your business. Get 10% Off the Main Conference Registration Fee! Please note, discount does not apply to previous registrations and cannot be used in conjunction with other discount offers. This offer is not valid when registering online. Join WITI @ CommunityOne East! Join us for two jam-packed days of education, innovation, and exchange. Come together with fellow developers and technologists to evaluate dozens of open-source projects currently powering leading Web companies, transforming enterprise IT, and enabling next-generation computing. Main conference is free, but space is limited. Register today! Join WITI @ Gartner Business Process Management Summit! Business processes lie at the heart of a company's ability to survive, thrive and capitalize in today's climate. This Summit offers insight on creating and sustaining a process-powered organization. Clients will learn how to align business strategy and IT to maximize operational agility, providing opportunities to expand revenues and productivity. Join WITI @ w2wlink.com's Ascendancy Awards for Business Women! w2wlink.com, the premier professional women community, is awarding business women who have ascended to achieve and innovate in Corporate, Entrepreneurial, and Transition to Transformation settings. In addition to recognition for their accomplishments, the National Winners will each receive a prize of a private business club membership for one year from ClubCorp, and a pair of round-trip tickets to any destination in the contiguous United States from American Airlines, along with other sponsored prizes. Recognizing women who are ascending professionally and mentoring other women around them encourages positive change in the next decade: brings higher levels of women in the executive ranks, more women entrepreneurs with growing businesses and more female directors on boards. We encourage every business women to participate in this unique opportunity to reward and inspire women to maximize their potential in their careers! Nominations are being accepted for winners in eight cities and an additional any other city "At Large" category. Cities: Atlanta, Boston, Chicago, Dallas/Ft. Worth, Houston, New York City, San Francisco, Washington D.C. Three National winners from the 27 winners will be selected by an executive women advisory board. For more information and to request nomination and application forms, email [email protected], or go to w2wlink Events and Seminars, now through March 31, 2009 - with winners announced May, 2009. Join WITI @ CONNECTIONS™ European Summit! Network with Parks Associates' analysts and hear insights from key executives focused on new video services and IPTV, digital media and distribution, and customer support services. What can communications and broadband service providers do to acquire and retain subscribers, differentiate their services, and create new revenue streams? Hear from executives from MSTV, Thomson, Radialpoint, ActiveVideo Networks, Pace. Macrovision, Valens Semiconductor and more! Join WITI @ AIIM 2009! Don't miss the definitive industry gathering for information management professionals across industries and lines of business. Experience 19 tracks, over 135 sessions featuring 100+ end-user case studies, an Expo floor showcasing 200+ information management technology providers, AIIM-produced practitioner-level pre-conference workshops, a special SharePoint workshop, lots of networking opportunities, and much more! Assess and select new business applications or platforms, build the business case for their adoption, and simplify the process of implementing and integrating new solutions. Visit www.aiimexpo.com for event details, highlights and registration. Join WITI @ IBM IMPACT 2009! Join us in Las Vegas for Impact 2009 at the Venetian Resort Hotel & Casino in Las Vegas. It's sure to be an action-packed, five-day event with comprehensive SOA and WebSphere education to help you overcome pressing business and IT challenges! There will be 3 Promotions just for you, WITI Members! In addition, Tuesday, May 5th will be a very special day for WITI Members. At 5:15pm, we will run a session titled "How to Use Social Media as a Woman to Network" followed by a complementary Super Women's Group Reception, co-sponsored by WITI and IBM, from 6-7 PM at the Venetian Resort & Casino. Last year we had over 300 "super" women at the reception - we are aiming for more this year! Visit www.ibm.com/soa/impact2009/register for Complete Details!